← What are the Top 5 Raclette Dinner Parties? Raclette Parties are always fun to host. They bring people together and help family members to bond. Raclette grills simply cook for you. When we make a raclette dinner party, of course we want to surprise our guests with some neat cooking ideas for the grill. 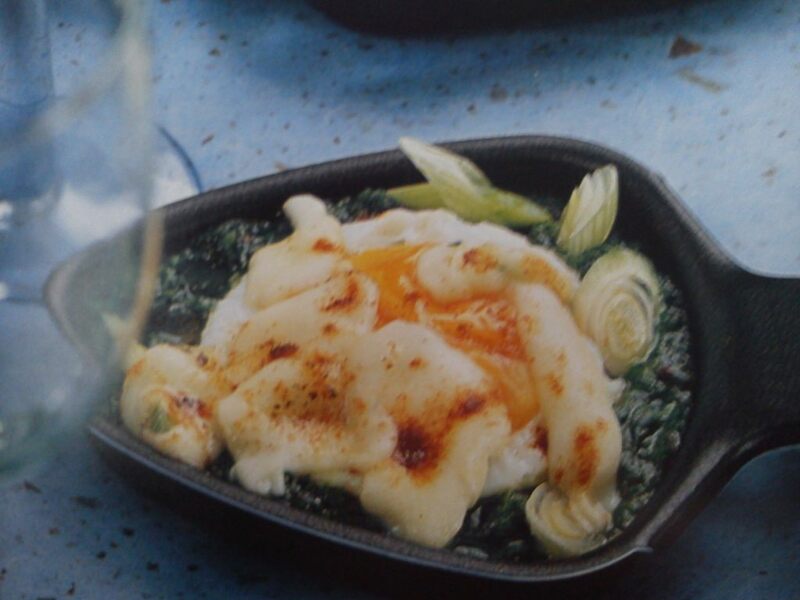 One of our favorite recipes is Creamed Spinach with Eggs in the Raclette Pan . For the recipe you will need green onions, mozzarella cheese, creamed spinach, salt, pepper, eggs (one egg per person) and Hungarian sweet paprika. 1. Clean green onions, rinse them and cut into fine rings. 3. Place a few spoons of creamed spinach into the individual raclette dish to fill it half full and add a few green onions. Put the raclette dish on top of the raclette grill to warm it up. Season with salt and pepper. 4. Break open one egg onto the raclette dish with the spinach. Keep the raclette dish on top of the grill for about 7 minutes so the egg can cook and solidify. 5. Top it off with mozzarella cheese and season it with the Hungarian sweet paprika. Place the dish under the heating element for another several minutes. It is all done! Enjoy your food creation! It is very easy and tasty! For 4 servings you will need 3 green onions, 9 oz. of mozzarella cheese, ¾ cup of creamed spinach, 4 small eggs, salt, pepper and Hungarian sweet paprika to your taste. This entry was posted in Raclette Cooking Recipes and tagged eggs and mozzarella, indoor raclette grill, mozzarella raclette grill, raclette dinner party recipes, raclette dinner recipes, raclette grill, raclette grill healthy recipes, raclette party, raclette party menu, raclette with spinach and eggs, spinach, spinach and eggs, spinach with raclette grill. Bookmark the permalink. I have never seen one of these before. I love to entertain, and I think this would be such a great thing to be able to add to my entertainment collection.